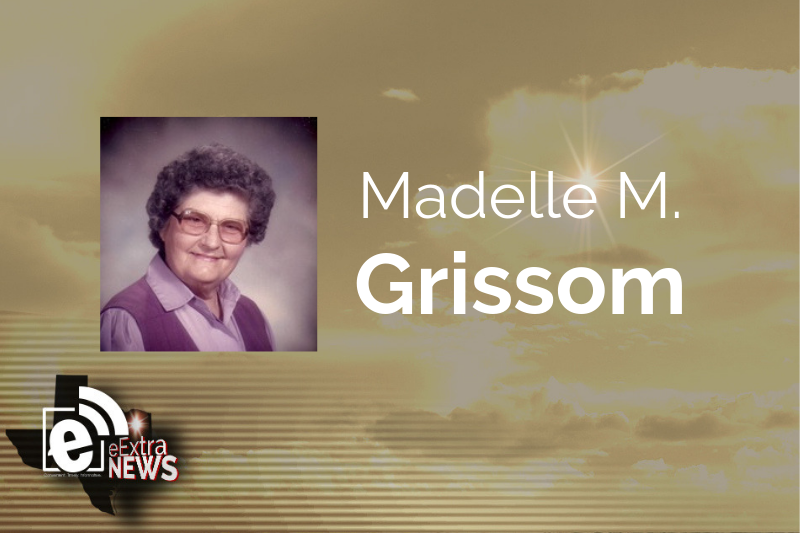 Madelle M. Grissom, age 97, passed away on March 20, 2019 in Mt. Pleasant. She was born on August 3, 1921 to James Yancy and Lucy (Armstrong) Mebane in Titus County. Madelle grew up in the West New Hope Community. Madelle was married to Leonard Ray Grissom for 61 years. They had a poultry farm in the Bridges Chapel community and were active members of the Bridges Chapel Methodist Church. Madelle was also an excellent seamstress and worked at a clothing manufacturer in Mt. Pleasant, in addition to making her daughter’s and granddaughters’ clothing as well as her own. She is survived by her sons; Douglas & Annie Grissom of Houston, Daniel & Jan Grissom of Mt Pleasant; Daughter, Donna Irwin of Garland; Grandchildren, John Grissom, Karen Addiego, Jeff Grissom, Kendra Rester, Jeremy Grissom, Brandi Leal and Christopher Irwin; Great Grandchildren, Jenna Grissom, Julia Grissom, Allye Grissom, Jack Grissom, Ben Grissom, Rex Grissom, Cade Rester, Coy Rester, Paige Grissom, AvaJade Grissom and ZoeRae Grissom, Corbin Irwin, Alexis Irwin, Paiton Irwin, Landon Leal, Caitlyn Wilcoxson, Dillon Wilcoxson; Sister, Doye Lee of Denton. Preceded in death by her parents; husband, Leonard Ray Grissom; Sisters, Lucile Stewart and husband Morris, Foye Griffith and husband Joe; brother Chester Mebane and wife Betty; Brother-in-law, James Lee; grandson-in-law, Joe Leal. Funeral service will be Sunday, March 24, 2019 at Bridges Chapel Church at 2 p.m. with burial to follow at Bridges Chapel Cemetery. Family will receive friends Saturday, March 23, 2019 from 6-8 p.m. at Bates-Cooper-Sloan Funeral Home.